We are lucky enough to have worked with some of the UK’s most highly respected commercial photographers, since 2014. Photographers have fierce competition when it comes to landing projects and building their portfolio. Many photographers are utilising SEO to get a better flow of leads and have a passive marketing process in place, allowing them to focus on landing the clients and doing shoots. Understanding this need, we have helped some established photographers get a greater market share from organic search. In spring 2014 we began working with Greg, who was looking to achieve visibility in Manchester and the North of the UK for his commercial photography business. Greg has various areas where he has excelled and carved out a niche, for example his work with the healthcare sector, schools, construction and many more. All of these projects could act as a great way to attract targeted customers, if the onsite SEO was implemented effectively. Working with Greg, just one day a month has resulted in Greg achieving some top-rank national rankings, regional rankings and many local rankings such as ‘commercial photographer manchester’. We had noticed the possible issue of cannibalisation present on Greg’s site and we were keen to identify if this was the case. Cannibalisation is one of the most common killers for SEO and often goes undiagnosed for years. Fundamentally, the issue is when two or more pages are both telling Google they offer the same or very similar content. Google sees this as an attempt to achieve multiple rankings, and the result is both pages being penalised from ranking properly in Google. In this case, we had the homepage and a specific landing page for Manchester both accidentally competing for the keyword ‘Commercial photographer’. As well as this, there were blog posts and categories also battling for the ranking and sending all the wrong signals to Google. This is very natural as sites grow, more and more pages are added without consideration for the impact they will have on the other pages. Unless your site is being maintained by an SEO, it is unlikely you can ensure the balance is right. 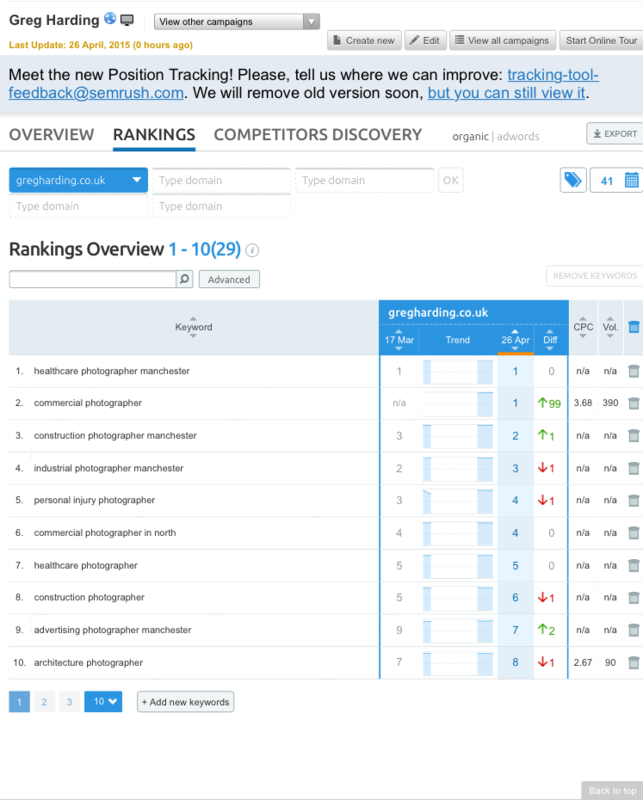 The diagram below shows a week-on-week ranking comparison, shortly after some onsite SEO carried out in April 2015 to address the cannibalisation of the keyword ‘commercial photographer’. 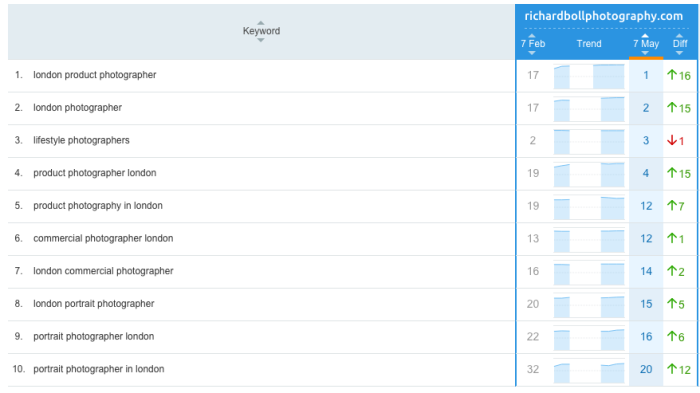 Keyword research – identifying and targeting the most profitable keywords based on the searcher’s intent and volume of searches for that keyword. Competitor analysis – understanding the winning strategies competitors are implementing to achieve better rankings and more organic traffic. Landing page SEO – honing in particular landing pages for projects and performing onsite SEO on those pages to achieve better long-tail rankings, such as healthcare photographer. Backlink audit – auditing backlinks to the site to ensure only the best, most relevant sites link to his site. This has a massive impact on organic traffic. Placements – securing guest author spots in some of the UK’s most respected photography publications. 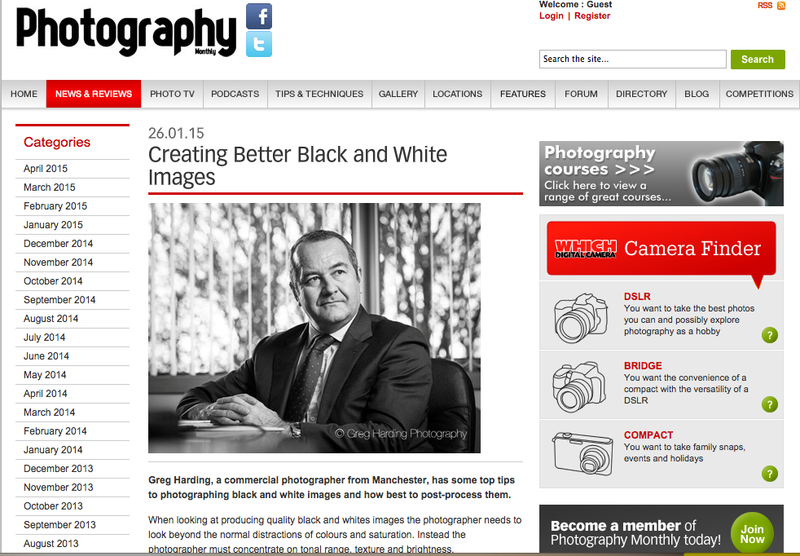 Creating industry Q&As to position Greg as a thought-leader in commercial photography. In Summer 2014 we also began working with Richard Boll, who was looking to target London and achieve various rankings to minimise risk of relying on one keyword too heavily. Richard’s site, like many photographer’s websites was purely designed in terms of visual appeal and simplicity. The downside of this approach is that the site may suffer in terms of its ability to rank well in Google. Richard didn’t want to spend large amounts of money on redeveloping the site, so our SEO recommendations had to be less intrusive than an overhaul of the entire website. One of the most fundamental issues we found was expecting the homepage to do too much. This is very common and is identified by seeing if any other pages than the homepage, ranks for any primary or long-tail keywords. If the homepage is the only page that appears to rank in Google, then the answer is that you have not approached onsite SEO properly. The problem with having your homepage as the only ranking page, is that Google will likely find it hard to rank you highly for a variety of keywords. With this diagnosis, we had to get the site achieving multiple rankings with landing pages and make use of a massive gallery of images. Richard’s results have been positive, with position 3-4 for ‘London Photographer’ being achieved, alongside many more rankings for specific services. In the past Richard’s complaint with his SEO performance, was volatile rankings and periods where he was not showing up at all. He no longer has this issues and is currently reaping the benefits of a diversified set of keywords performing nicely for him. 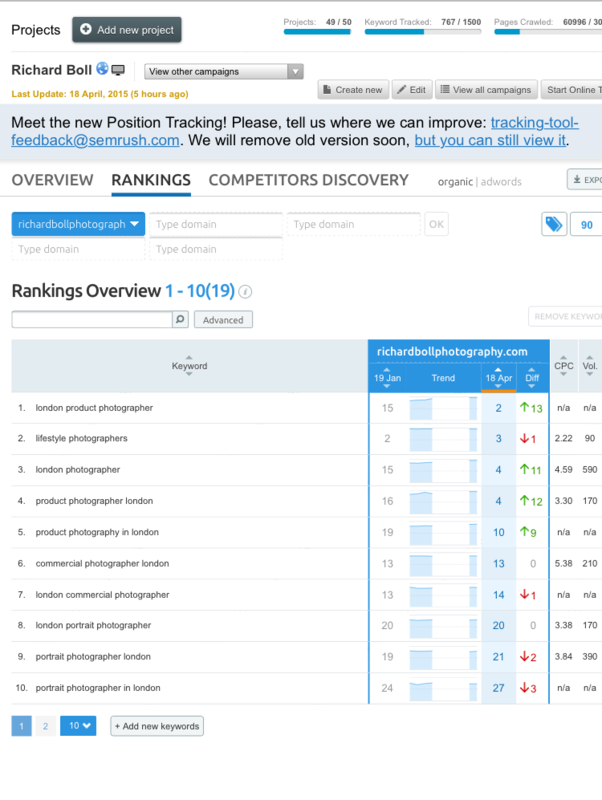 Checking in just one month later, we are very pleased to see rankings develop even further, with ‘London photographer’ reaching number 2 by May the 7th. SEO has played a vital role in the development of both of these photographer’s businesses and will continue to yield a return on investment.